Our diverse legal team is a fully integrated part of our client teams, combining disciplines to deliver holistic, business focused advice. Our team works seamlessly with their Assurance, Tax, Transactions and Advisory colleagues to provide comprehensive, business services to clients. We approach projects collaboratively, listening first to gain a deep understanding of project objectives, and focus on integrated advice and delivery, whether from a legal, tax or accounting perspective – or the combination that best suits you. As part of a global network of 2,100+ law professionals across 82 countries, we focus on providing practical, workable proposals, whether in one or many countries. We are a diverse team of lawyers working with the wider EY business, our clients and other stakeholders. This edition reviews the seven completed cases from the second half of 2016, plus the landmark DPA which completed in January 2017. We explore the implications of the UK’s decision to leave the European Union. We asked over 175 tax and finance professionals headquartered in the UK and overseas for their views on how the tax system affects the UK’s attractiveness post-Brexit. Can lawyers help where law firms can't? At EY, our lawyers work as integrated members of our diverse client services teams. Together, we can help you protect, grow and transform your business. Should lawyers do more talking, or more listening? At EY, our lawyers are fully integrated into our diverse client services teams, enabling us to ask better questions and, by listening to our clients, ensure all their business objectives are understood and met. Can lawyers make business work better? 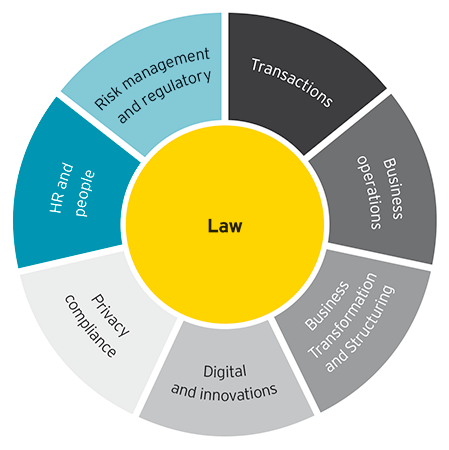 At EY, our lawyers work as integrated members of our diverse client services teams which enables us to collectively develop services, processes, systems and technologies that help our clients transform their businesses. Our AI enabled legal due diligence service gives a comprehensive picture of any business. Our review combines experienced lawyers with cutting edge AI technology to identify risks and rewards in varying sized datasets. Find out how our legal team helps technology firms grow and protect their business.